When someone tries to install Office 2010 on Windows XP Service Pack 2 he may face incompatibility problem. Because Office 2010 has no official support for XP SP 2. To install Office 2010 you might not like to change your OS. But even after you would like to use the wonderful version of MS Office. There are 2 ways to install Office 2010 on Windows XP. The first one is a simple registry trick. The second method is more easy and reliable. Simply download the MSXML file from Microsoft. Then install it on your XP SP 2. Now you are almost done. Enjoy Office 2010. NB: Do not install Office 2010 in a low configuration PC. To see the system requirement, click here. Labels: Install Office 2010 on XP SP 2, Microsoft, Tips n Tricks, Troubleshooting, XP SP 1. Office 2010 system requirements. 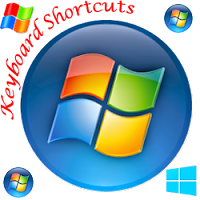 Someone may think that in this GUI (Graphical User Interface) generation, this is very funny to memorize the keyboard shortcuts. But if you wanna be a smart user you should do. There is no other shortcut way to avoid shortcuts. Tips: Though this shortcuts applied to Windows 7, more than 90% of them will work with XP, Vista and 8 too.